Palau (7° 30' N, 133° 30' E) Palau, Micronesia (also known as Belau) is situated among the Western Caroline Islands on the western Pacific rim. The Palau archipelago consists of more than 350 islets most of which are remnants of a tectonically uplifted coral reef. The curved island chain runs for 150 km from North to South is 25km across at its widest point. The nearest large landmasses are New Guinea to the South and the Philippines to the West, both approximately 800km from Palau. Palau has a total landmass of 458km2, Babeldaob is the largest island in this archipelago and covers an area of 363km2, which is more than 80% of the landmass of the entire archipelago. The remainder of the landmass consists of three volcanic islands (Koror, Ngerekebesang and Ngemelachel), an atoll (Kayangel), platform like reef islands (Peleliu, Anguar and parts of Koror) and several hundred uplifted coralline limestone islands or “Rock islands”. In the Western pacific trench system, the Cenozoic subduction zone has lead to the Western Pacific basin being rimmed by trenches, back arc basins and island arcs. The islands constituting Palau are apart of one of these island arcs systems. The 350 islands and islets of the Palau archipelago constitute the southernmost exposure of the Kyushu Palau Ridge. Most of the islands are guarded by a barrier reef with the exception for Kayangel Island in the North, and Anguar island as well as South West Island group to the South. Palau is tectonically active with Babeldaob and Koror still rising relative to sea level. A typical beach in Palau. Note the rock island in the distance. Babeldaob is the largest island and primarily formed as a volcanic island. The volcanic substrates consist of breccias and interbedded tuffs formed during the Eocene and Oligocene. Within this volcanic substrate there are three distinguishable geologic units; the Babelthaup formation, the Aimeliik formation and the Ngeremlengui formation. These stratigraphic units record 12 million years of arc history. The erupted material consists of basalt, andesite and dacite. Although eruption was submarine, the islands were formed by subsequent uplift. The erosion of the volcanic units during the Miocene to Pliocene lead to the formation of clay deposits in the low coastal waters, this clay formation is known as the Airai clay. The interior uplands of Babeldaob are formed by three low ridge systems and have a maximum elevation of 242m above sea level is reached. The low ridge system is heavily eroded and has well rounded peaks, giving Babeldaob an undulating terrain. Early studies of the geology of Babeldaob were thought to indicate tectonic upliftment and it was suggested by Snyder and Butler that no submersed habitation sites were likely on Babeldaob. However, the recent recognition of Holocene subsidence brings to light the possibility that the integrity and visibility of cultural deposits maybe compromised by wave erosion and tidal fluctuations. The rock islands are made of what is colloquially known as “Palau Limestone” which is actually raised coralline reef structures that formed in the warm waters that characterized the western Pacific during the early Miocene to late Pliocene, the calcareous detritus of these ancient reefs are cemented by calcite. These karstic (cave forming), limestone islands are defined by narrow elongated and precipitous ridges. The islands have poorly developed soils and no surface drainage. The rock islands typically have a distinctive mushroom shape and can range from 10m to 200m in height. The distinct shape is a result of the limestone being undercut at sea level by a solution notch which forms an overhang. These overhangs can range from 0.5 meters to 6 meters in height. The topography of the rock islands is caused by the freshwater dissolving the limestone, often forming features such as fissures, sinkholes, caves and speleothems will form. The maritime tropical climate of the Palau islands is characterized by low seasonal variation. Palau has a mean annual temperature of 27oC and the range in variation from the coolest months (January and February) to the warmest month (April) is less than 4oC. Daily rains and short but torrential storms provide 3.8m of rain annually. The annual humidity on the islands is as high as 82%. The Rock Islands are typically covered with a dense mass of tropical rain forest. The larger volcanic islands have vegetation varying from tropical rain forest (Approximately 75% of the Palau islands are forested) to savanna, and broad belts of coastal mangrove swampland. Within the forests there is a great diversity of plant life. The upland forests are known for their hardwoods, palms and pandanus. 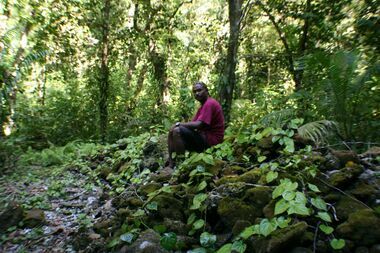 The food producing forests associations are known for resources such as coconut, breadfruit, mango, banana and betelnut. Several species of taro, cassava, pineapple and tobacco are also grown in garden areas by indigenous Palauens. Swamp and Mangrove forests are found on coastal lowlands where the terrain is level and these forests that prevent the eroding soil from washing into the lagoonal areas. A large portion (16%) of Babeldaob is covered in savanna/grassland environments. While much of the savanna environment may be the result of human activity, a large portion of it is almost certainly due to the poor soils on the volcanic island. A variety of other habitats are also present on Palau including patch, fringing, and barrier reefs, reef walls, mud flats, sand and rubble flats, sea grass flats, mangrove forests, estuaries, freshwater streams, lakes, both fresh and marine, and the Rock islands. Prior to human habitation, there were no mammals or terrestrial reptiles on Palau probably due to its extreme isolation and distance from other large landmasses.. Early settlers probably imported pigs, rats and possibly fruit bats Today, there are typical domestic animals kept by islanders. In island colonization, deposits are identifiable from “the faunal assemblages representing human predation on a pristine environment”. Due to the lack of endemic terrestrial faunas, the timing of the first human colonization of Palau is unclear, but it has been proposed that people from the Philippines colonized Palau. Palaeoenvironmental and palynological data suggests occupation of Babeldaob occurred as early as 4500-4300 BP, while archaeological evidence points to the first occupation of Palau at 3400-3100 cal BP. 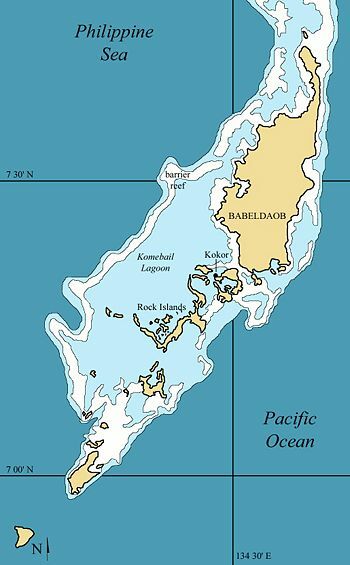 Clark et al propose that early settlers to arrive on Palau concentrated on the large volcanic island of Babeldaob and that occupation of the rock islands was limited. The earliest dates recorded for the settlement of the Rock islands is 3100-2900 cal BP, evidence for this is found on the island of Ulong, Ngemelis, Ngeruktabel and Ngeanges. Human settlements on the rock islands were abandoned by 500BP. While the main habitation was on the larger island Babeldaob, it is suggested by Clark et al that the smaller islands were used for the collection and consumption of fish or as burial sites for the people from nearby Babeldaob. Prehistoric cultural patterns on Palau have been documented using the geographic spread of pottery on the island. Archaeological sites are found throughout the volcanic islands in the form of; highly visible terrace formations (on the large savanna areas of the volcanic islands) and clustered stone features which are the remains of traditional villages. These sites are scattered throughout the archipelago. Archaeological research began in 1929 with the work of Hisakatsu Hijikata, a Japanese Anthropologist who described pottery from several areas on Babeldaob. A great deal of the early archaeological work concentrated on the larger islands of Babeldaob, Peleliu and Anguar. The work was predominantly on the description of ceramic artifacts, stone carvings, glyphs as well as terrace and village sites. Stone walling on a Rock Island, Palau. The stone walling is part of a number of structures including burial mounds and is probably either defensive walling or storm sea-walling protecting a village. The structures are probably not more than 1500 years old. The human is for scale. 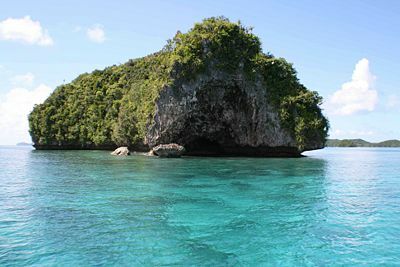 In recent years the rock islands have received more attention and this has yielded new insights into the eearly history of Palau, such as settlement dates ranging from 3300-300BP, prehistoric fishing practices as early as 1700 BP and human exploitation of the coral reefs. From 1993-1997 Pregill and Steadmanexplored Palau in search of late quaternary vertebrate fossils; they found fossiliferous sediment in Palau to be remarkably scarce. This was considered due to caves in the area being either, too small to hold appreciable sediment, lacking in sufficient horizontal surfaces and damp (this causes bones to decay in the organic sediment rather than preserve). Another factor considered was the events of WWII; caves were often used amongst other things as storage facilities by Japanese soldiers and thus material may have been destroyed. While this would have seriously diminished the palaeontological potential of the caves, recent work has suggested vertebrate remains, particularly those of humans may be more abundant than hypothesized by Pregill and Steadman. The first contact between Europeans and Pacific islanders occurred as early as the 1500’s. However, there were cases where, despite massive efforts by Europeans to discover new islands, some of the Pacific islands remained relatively free of European influences; Palau was one of these islands. In 1783, an English ship, the Antelope, ran aground on a reef west of Ulong. While the crew built a small ship and left the island three months later, George Keate, a member of the crew, documented the remarkable story of the wreck. Keate’s account was published in 1788 and for the first time accurate information on Palau’s location and description of the surrounding reef was available. Prior to the 1788 publication, there were vague references in maritime documents, to what may have been sighting of the Palau islands. Error on call to Template:cite web: Parameters url and title must be specifiedHezel (1983). .</ref> The landing of the Antelope on the Palauan shores occurred nearly two centuries after European contact with other nearby islands. After 1783, European landings became commonplace. In the 19th century Palau was frequented by trading vessels and under British rule a harbor was established by Andrew Cheyne in 1840. Cheyne had several rivalries due to the trepang trade (which he initiated) this, coupled with his harsh treatment of the Palauan people lead to his murder in 1866. The trepang trade increased a German interest in Palau this interest grew steadily throughout both the British and Spanish administration. 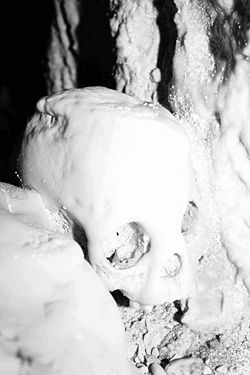 Skull covered in flowstone found in Bone Cave, Palau and possibly representing a small bodied human. In 1855 the Spanish gained controlled of Palau, by which time the trepang trade had shifted to the Philippines and Indonesia and Palau no longer played an important role. Neither the British nor the Spanish did much to develop the islands. In 1898 Spain sold its rights to Palau to Germany. Under German rule several mining and copra plantations were established and operated. The first significant social reform came during the period of German administration, where the Palauan people were relocated to larger villages. The German administration ended in 1914 at the start of World War I when the islands were seized by Japan in 1914. Following WWI, the Japanese civilian government made a series of major changes to Palauan life and in 1922 Japan received a League of Nations mandate to administer the development of the islands. Koror was developed as an administrative center of Japanese possessions in the north Pacific.In 1947, following occupation by US forces in World War II, Palau became part of the UN Trust Territory of the Pacific Islands, which was administered by the United States. During their period of rule, the Japanese established schools and constructing modern water and electrical system. During WWII Palau was seized from the Japanese by American troops. From the end of WWII to 1948 Palau was administered by an American military government who received a United Nations mandate to govern the islands in 1947. After three decades as part of the UN Trust Territory of the Pacific under US administration, this westernmost cluster of the Caroline Islands opted for independence in 1978 rather than join the Federated States of Micronesia. A Compact of Free Association with the US was approved in 1986, but not ratified until 1993. It entered into force the following year, when the islands gained independence. Recently, remains of what are reported to be abnormally small people who may have been the evolutionary product of island dwarfism have been discovered in burial caves in Palau’s Rock Islands. The Palauen fossils are described as exhibiting a surprising number of traits that were originally used to describe the Hobbit or, Homo floresiensis, as a unique species including, small body size, relatively large teeth, small faces and reduced chins. The Palauen fossils come from two burial caves in the Rock Islands of Palau, in the Pacific Ocean. The caves where the fossils have been discovered are literally filled with tens of individuals. The brains of the Palauen humans are thought to be small, at the very bottom or even below modern human variation. The remains date to between 1500 and 3000 years ago. Palau was the scene of significant combat during WWII. Task force 58’s operation DESECRATE ONE on March 30-31, 1944, more than 60 Japanese ships were sunk . The attack involved U.S. carrier based aircraft attacking Japanese shipping and land based targets situated throughout the Rock Islands and on the main islands. Japanese artefacts on the well known "Helmet Wreck" near Koror. The Japanese sub-chaser was sunk by an unknown American pilot during operation Desecrate One on either March 30th or 31st, 1944. Note the encrusted Japanese rifle lying in the center of the image. A less visible machine gun may be seen in the lower right and shells and cartridges as well as pots and pans are visible in the background. One of the bloodiest land battles of the U.S. led Pacific campaign began on Sept. 15th, 1944 when the 1st Marine Division landed on the beaches of Peleliu island near the southern end of the archipelago with the intent of taking what was considered a strategic airfield. The 15 square mile island was reportedly defended by upwards of 13,000 well entrenched Japanese troops and the invading U.S. Marines fielded as many as 20,000 troops. Following more than 70 days of fighting, a Japanese commander surrendered. By that time more than 1,500 U.S. servicemen had been killed and more than 10,000 Japanese servicemen had died. Diver at the world famous blue corner, Palau, Micronesia. 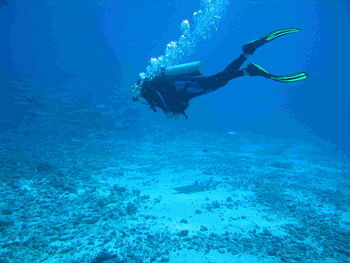 Palau is famous for its excellent underwater visibility and abundant marine life. Note the reef shark resting on the bottom in the background. Palau is world-renowned for its diving. Situated just of the Palau trench, deep water up-welling creates an ideal environment for a rich and abundant marine life. 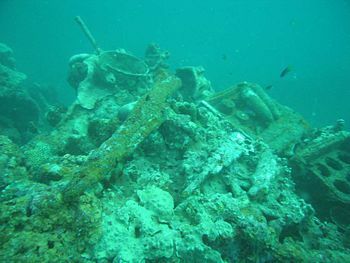 Famous dive localities include Blue Corner, Blue Hole and diving the many WWII wrecks. In 1686, the Spanish explorer Francisco Lezcano named Yap Island (now in the Federated States of Micronesia) "La Carolina" after King Charles II of Spain. The name was later generalized to include all the islands. Stingless jellyfish of the genus "Catostylus" in Jellyfish Lake, Palau, Micronesia. Palau has a number of enclosed brackish lakes that have evolved a species of stingless jellyfish of the genus "Catostylus". 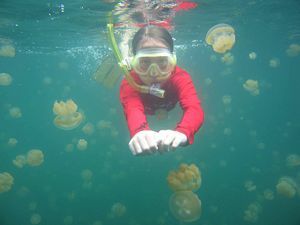 One of the lakes - known as Jellyfish Lake - can be visited by tourists who are allowed to snorkel with the Jellyfish. ↑ 1.0 1.1 1.2 1.3 1.4 1.5 1.6 1.7 Fitzpatrick, S.M and Kataoka, O. (2005). 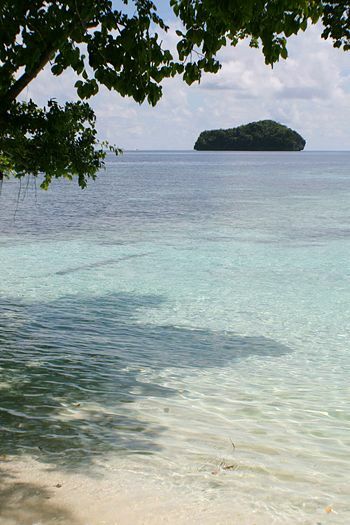 Prehistoric fishing in Palau, Micronesia: evidence from the Northern Rock Islands. Arch Oceania, 40: 1-13. ↑ 2.0 2.1 2.2 2.3 2.4 2.5 Hawkins, J.W. and Castillo, P. (1998). Early history of the Izu-Bonin-Mariana arc system: Evidence from Belau and the Palau trench. The Island Arc, 7: 559-578. ↑ 3.00 3.01 3.02 3.03 3.04 3.05 3.06 3.07 3.08 3.09 3.10 3.11 3.12 3.13 3.14 3.15 3.16 3.17 3.18 3.19 3.20 3.21 3.22 3.23 3.24 3.25 3.26 3.27 3.28 3.29 3.30 3.31 3.32 3.33 3.34 3.35 3.36 Snyder, D. and Butler,D.M (1997). Early history of the Izu-Bonin-Mariana arc system: Evidence from Belau and the Palau trench. Micronesian Resources Study. ↑ 4.0 4.1 4.2 CIA (2007). CIA factbook. ↑ 5.0 5.1 Olsudong, R. (2006). Cultural Heritage and Communities in Palau. Micronesian Journal of the Humanities and Social Sciences, 5(1/2): p547. ↑ 6.0 6.1 6.2 6.3 6.4 6.5 6.6 Clark et al (2006). Human Colonization of the Palau Islands, Western Micronesia. Journal of Island and Coastal Archaeology, 1:215-232. ↑ 7.0 7.1 Mason et al (1956). Military Geology of Palau Islands, Caroline Islands. U.S. Army Engineers, Intelligence Division, Headquarters, U.S Army Pacific. ↑ 8.0 8.1 8.2 8.3 8.4 Berger et al (2008). Small bodied humans from Palau, Micronesia. PLoS One. ↑ 9.0 9.1 9.2 9.3 Fitzpatrick, S.M. (2003). Early Human Burials in Palau: Evidence for a 3000 Year Old Occupation of Palau. Antiquity. ↑ 10.0 10.1 10.2 10.3 Pregill, G.K. and Steadman, D.W. (2000). Fossil Vertebrates from Palau, Micronesia: A Resource Assessment. Micronesia, 33(1/2): 137-152. ↑ 11.0 11.1 Nationsencyclopedia.com (2007). ↑ 13.0 13.1 13.2 13.3 John Noble Wilford (2008). Discovery Challenges Finding of a Separate Human Species. ↑ 14.0 14.1 Gilliland, A.O. (1994). Peleliu remembered. Booker publications. This page was last modified 16:34, 29 April 2011.